Wire Mesh Decking Over Wood Decking? – Canadian Rack Inc.
Wire Mesh Decking Over Wood Decking? The modern warehouse storage facility is comprised of many components that combine to create an efficient and safe storage ecosystem. The main components of the pallet rack storage system are the frame uprights (posts) and cross beams. You could store pallets on this structure, but it is neither optimal or safe. Aside from the post protection, the system requires cross bars and decking that is placed between the front and back beams. This is essential to protecting product and people. This discussion will deal with the debate over wire mesh decking and wood decking. This is a key area in the storage of pallets and product. As we know, the beams in your racking system are designed to support your pallets, therefore it’s quite important to choose the correct decking. The best approach is to compare wood decking with wire mesh decking. Knowing which one is the best solution is difficult. Which one gives the best support and the best price. Let’s take a look at the salient features of both and you can decide. But, there is one prevailing aspect of wood decking that will outweigh its benefits which we will examine later on in this article. So, do you want to know which one is better? We have compiled all the information you need to know. First, Do I Even Require Either Wire Mesh Decking or Wood? The vast majority of engineers and integrators would say yes, and we would concur for a number of reasons. If you choose not to use decking then at the very least you must have safety bars, that is a given and for another discussion. Decking provides that extra support that is vital for safety and efficiency reasons. The support comes in a form of crossbars on the Wire and Wooden decks, which is the perfect if you don’t have any loose items or cartons. You will use the decks to sit on top of the beam levels to hold it in place when pallets, carton and other stock gets placed on top. Decking on the beams will help broken or misplaced pallets, preventing them from falling through the beam levels. Wood deck enables you to store all types and sizes of pallets in your warehouse. 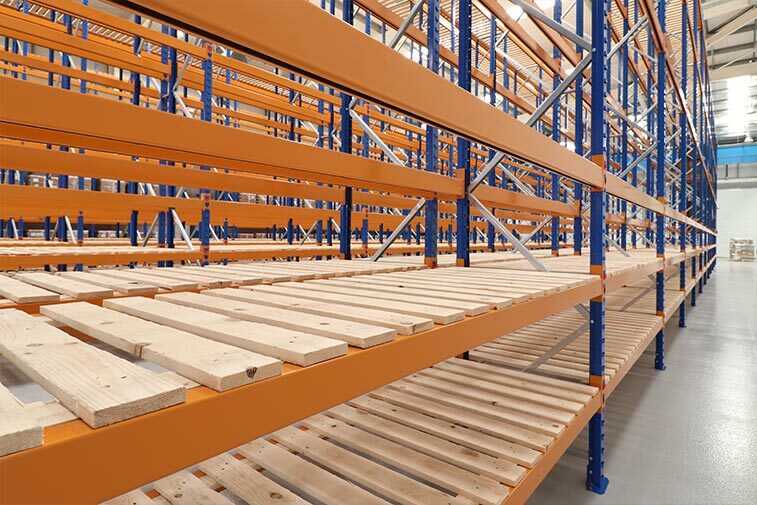 Wood decking provide sthat additional support to the pallets that don’t usually overlap the pallet racking area. Wood decking consists of slats of wood that nestle across the racking beams to provide support for the smaller and damaged pallets. It also provides you with a smooth surface storage area to allow you to place smaller hand loaded cartons of inventory. Closed Deck: This type of deck is fixed to the batten which acts as the location for the wooden deck against the inside faces of the pallet racking beams. The main advantage of closed decking is that no small cartons or product will fall through to the levels below or onto pickers. Closed deck pallets offer adequate hygiene and are a to clean, compared to open pallets. Open Deck: This decking rests onto pallet beams and can be made to fit all types and sizes of your pallet racking. The main disadvantage to open deck is problems with hygiene as they are harder to clean. Also, Open Deck pallets allow easier drainage and are often lighter than the closed decks making the easier for you to handle. 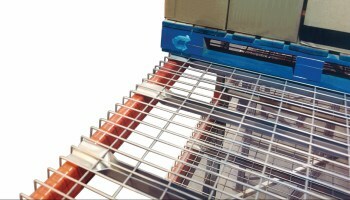 Many distribution centers and warehouse storage facilities are using wire mesh decks as a part of their pallet and product support. Steel is a symbol of strength and it certainly applies in this instance. With its rugged and durable material, the wire decks meet the industry standards for support a uniform distributed load including the surface of the deck over racking load beams. 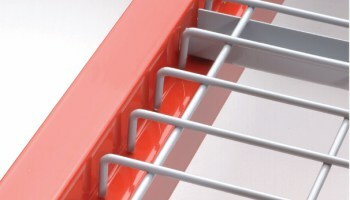 Prevent damage to your goods: Wire mesh decks keep loose items from falling and prevents damage to your goods. More importantly, it mitigates the threat of product falling through to lower levels and perhaps hitting a picker. When it comes to storing pallets or goods you need that peace of mind knowing people and goods are safe and secure. Great Storage: Wire mesh decks are known for effectively storing a wide range of product; pallets, cartons, stillages, and pick items. Wire mesh decks come in a wide array of configurations and sizes to accommodate all storage possibilities. Additional Safety: The third and probably main reason to use wire mesh decks is fire rating. Unlike wooden decking which will catch fire straight away, wire mesh decks will not. 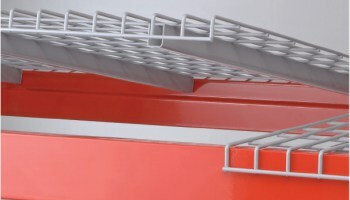 Additionally, and as important, wire mesh decks allow water from the overhead sprinklers to pass through the racking. enabling water to mitigate the fire damage before any of your goods are damaged. Up-Turned Waterfall: Built in backstop to prevent product from being pushed too far. Inside Waterfall: Inside Waterfall leaves beam face unobstructed for labels and barcodes. Flat Flush: Designed for hand stacked loads and order picking; fits inside load beams. Inverted Flare: Designed to fit most configurations. Inverted U Channel: Designed to prevent collection of dust and debris inside the channel. Flared Channel: Waterfall design with flared channel for box or structural beams. Wire mesh decking is stronger than wood decking.Wood decking will eventually warp over time. Wire decking allows smoke and heat to rise and sprinkler water to fall through into storage areas. Fire inspectors discourage wood decking for these safety reasons. Wire decking is more cost-effective than either wood or solid metal. Wire decks distributes the full weight of your products across the beams. Wire decking is easy to install. Wood decking requires fastening to battens. Wire decking improves air circulation. Wire decking is maintenance-free and rust-free. Wire decking allows more light to filter through, making easier to pick product and read labels. The light reflective qualities of the steel wire decking will brighten the warehouse. Wire decking is weather-resistant for outdoor use. Wire mesh decking minimizes dirt and debris.